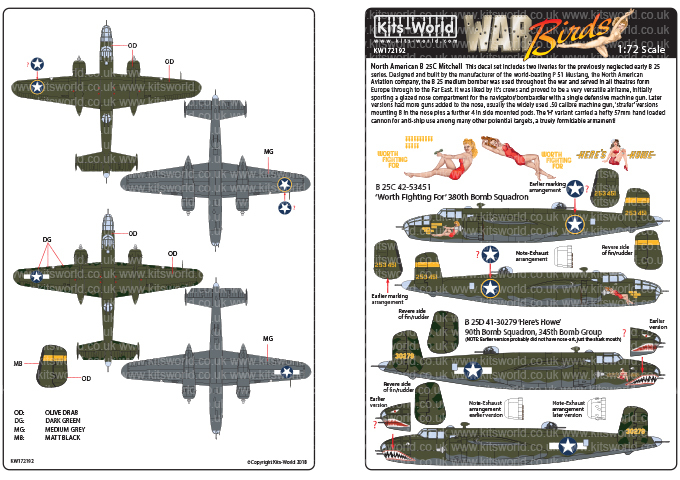 B 25C 41-12797 'Red Headed Gal' 3rd Bomb Group, 5th Bomber Command. 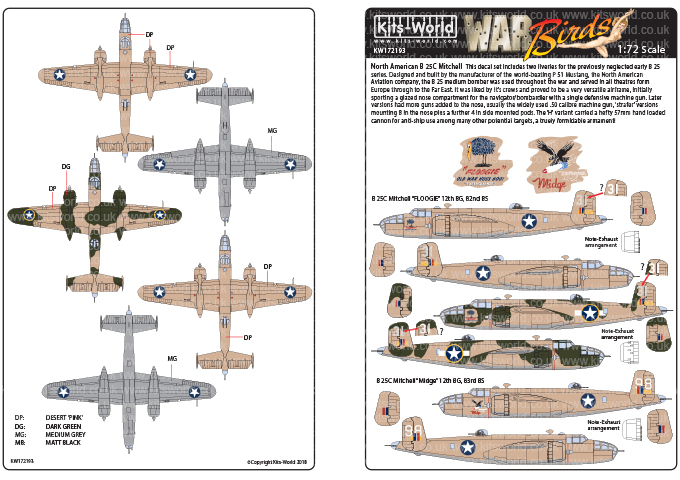 B 25C 42-53460 'Sand Blower' 486th Bomb Squadron, 340th Bomb Group. 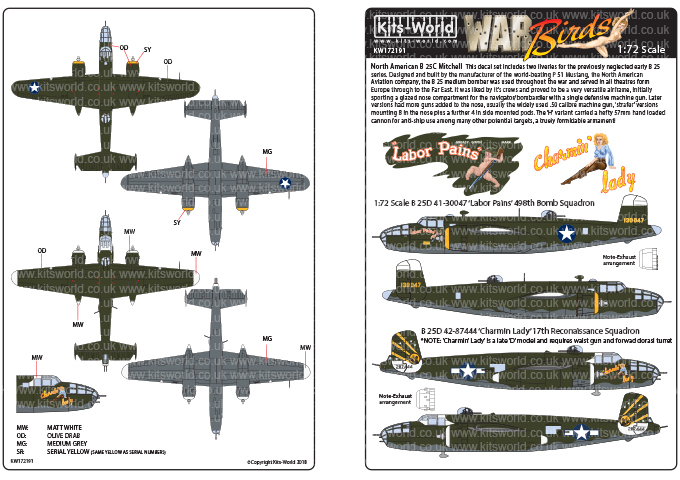 1:72 Scale B 25D 41-30047 'Labor Pains' 498th Bomb Squadron. 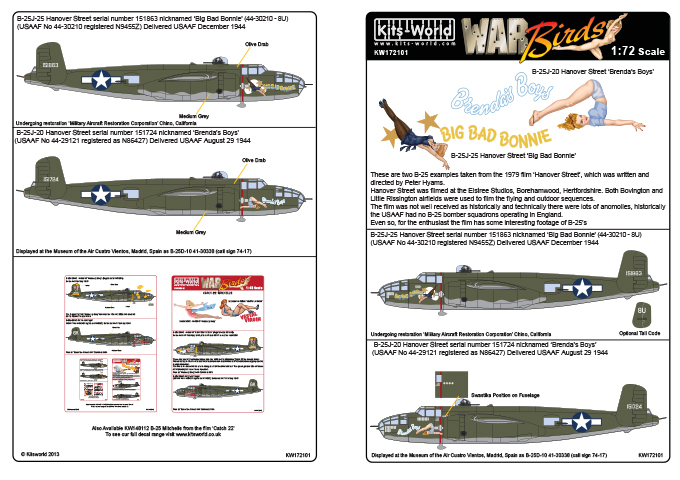 1:72 Scale B 25D 42-87444 'Charmin Lady' 17th Reconaissance Squadron. 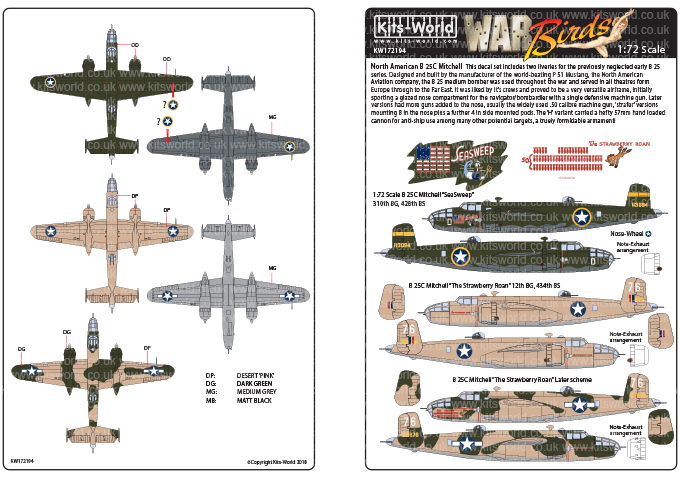 1:72 Scale B 25C 42-53451 'Worth Fighting For' 380th Bomb Squadron. 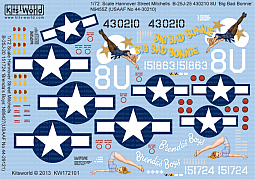 1:72 Scale B 25D 41-30279 'Here's Howe' 90th Bomb Squadron, 345th Bomb Group. 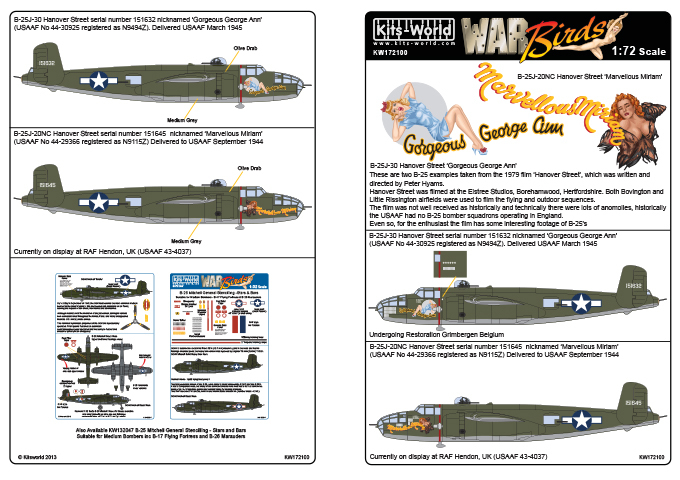 1:72 Scale B 25C Mitchell "FLOOGIE" 12th BG, 83rd BS. 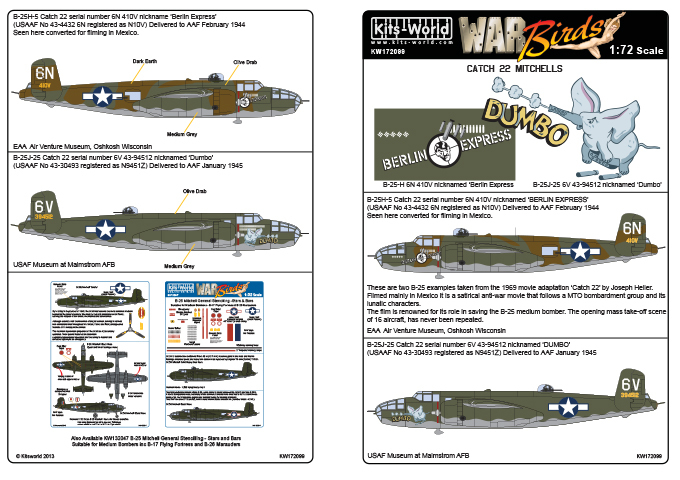 1:72 Scale B 25C Mitchell "Midge" 12th BG, 83rd. 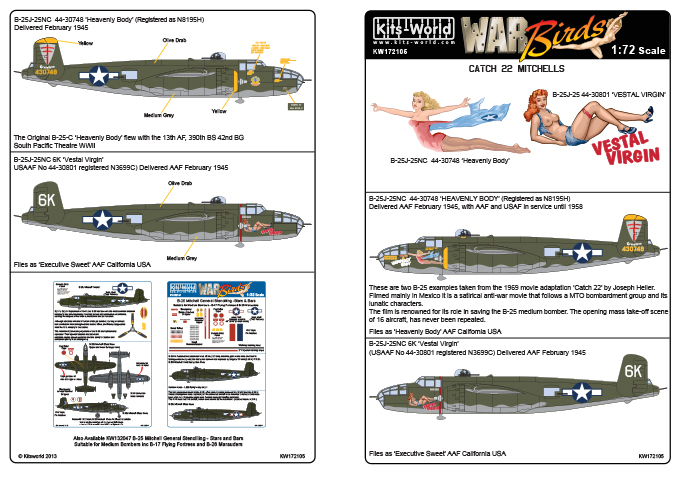 1:72 Scale B 25C Mitchell "SeaSweep" 310th BG, 428th BS. 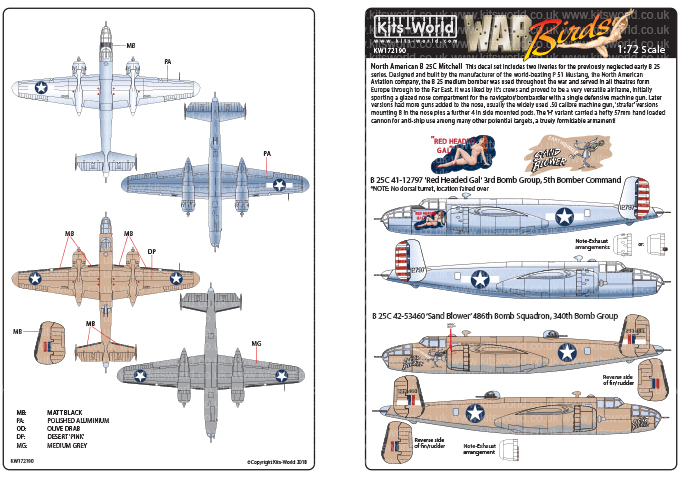 1:72 Scale B 25C Mitchell "The Strawberry Roan" 12th BG, 434th BS. 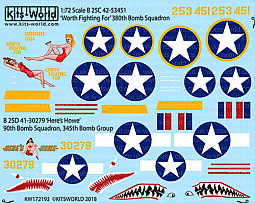 MUSTANG MKIII KH500/HBW of Wg.CDR. Harold. Bird-Wilson, 17 Sqn, Bentwaters, 1945. 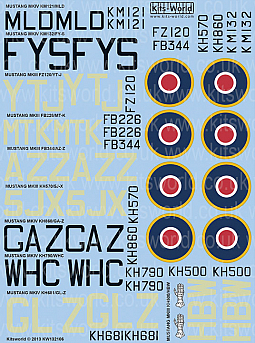 MUSTANG MKIII FZ120/YT-J of Squadron Leader D.H Westenra, No 65 Sqn Ford and Funtington, April 1944. 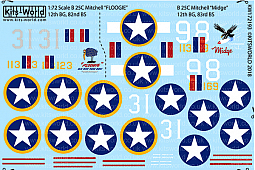 MUSTANG MKIII FB226/MT-K of Flg Off C.L.F Talalla, No 122 Sqn, Ford 12 June 1944. MUSTANG MKIII FB344/AZ-Z of Major W.H Christie, No 234 Sqn, Bentwaters, January February 1945. MUSTANG MKIII KH570/5J-X of Major A Austeen, No 126 Sqn, Bentwaters, 23 February 1945. 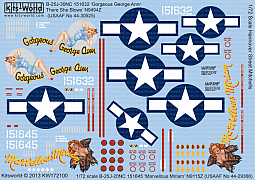 MUSTANG MKIV KH681/GL-Z of Capt H.J.E Clarke, No 5 Squadron SAAF, Fano, Italy, December 1944 January 1945. MUSTANG MKIV KH860/GA-Z of Sqn Leader J.A Storrar, No 234 Sqn Bentwaters, April 1945. MUSTANG MKIV KM132/FY-S of Sqn Leader P.C.P Farnes, No 611 'West Lancashire' Sqn, Peterhead, 28 July 1945. 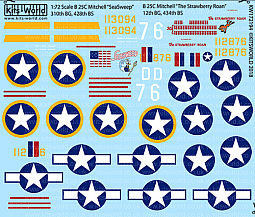 MUSTANG MKIV KH790/WHC Lt.Col. W Christie. 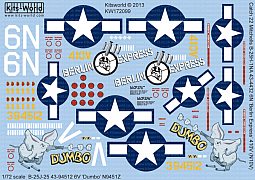 MUSTANG MKIV KM121/MLD Wg.Cdr. M. Donnet No 350 Sqn, Bentwaters, 1945. 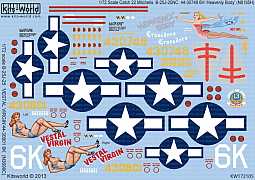 This sheet will also be available in 1:72 and 1:48 scale early 2016.